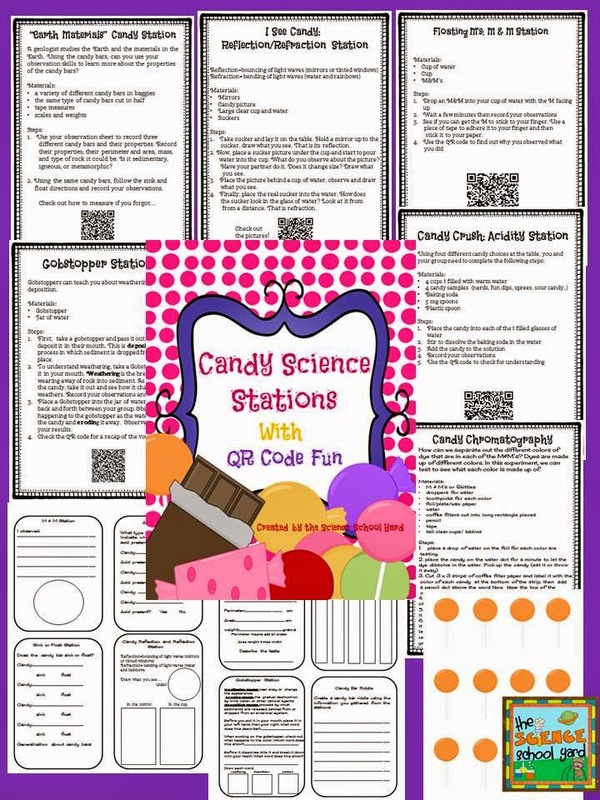 Ok...so I have seen some sites that show how to use candy to teach science concepts, so I thought I would use the FOSS concepts to see how I could teach some of the kit ideas as a refresher or introduction. We had a special celebration today on our half day...Halloween. We had our and littles sign up for stations...they got to do 2. I did...CANDY SCIENCE! We did the acidity test (great for a whole class demo or even small groups and to review the Calcite test and mixtures and solutions), floating M's from M&M's (the kids love this when they can get the M to stick to their finger), Earth materials candy properties (review of property words, mass, perimeter, area, and the beginning of density), sink and float with an introduction to density, candy chromatography (didn't love this when the kids did it, so I would do this as a station demo), reflection and refraction candy suckers. Not sure how to help kids with their large amount of Halloween candy? Have them bring in one piece to share. Check out the stations...in action...and set up! Sink and Float...and the beginning of density! Great for demo of citric acid reactions...fizzy fun! I put these stations into a pack! Check candy science at Candy TPT Link.